A place where they can reconnect with their loved ones by enjoying the "simple things" in life that the Finger Lakes provide: fishing with their children, toasting marshmallows beachside over a roaring campfire, observing a spectacular sunset over a serene and beautiful lake, or just relaxing and enjoying the solitude of lakeside living. 2015 was a banner year for us. We were able to provide 25 veterans with the opportunity to experience the beauty and serenity of our Finger Lakes; this is more than double last year. In addition, we also added 3 new donors for 2015. Needless to say, each veteran and their family were very grateful. It is these heartfelt expressions of gratitude that make our cause so rewarding. Our partner, the Veterans Outreach Center of Rochester, has done an outstanding job providing us with an endless list of deserving candidates. This is a true team effort. 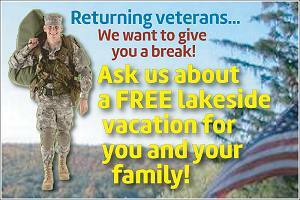 We have also created a new website for the program this year: www.FingerLakesVacationHomesForOurVeterans.com. Please share this with anyone you know who may be interested. "I'm writing to thank you for the support of our vets. I am a vet and this is by far one of the most thoughtful ideas I have seen. Most people do not know half of what it takes from a soldier and their family to do what we do. Thank you again." "Moving to Rochester and meeting the wonderful people at the Veteran's Outreach Center and throughout the city is the greatest thing I have ever known. The VOC and their loving volunteers give us veterans the gift of a new life. The best think of all is that your generous gift is the greatest birthday present I have ever had in 52 years. My birthday is June 9th. I was overwhelmed by the offer. I wept tears I didn't know I had left but they were happy ones. Happy tears indeed. From the bottom of my heart, I thank you." These are just a couple of the heartfelt messages we've received. It demonstrates that we are making a significant difference. 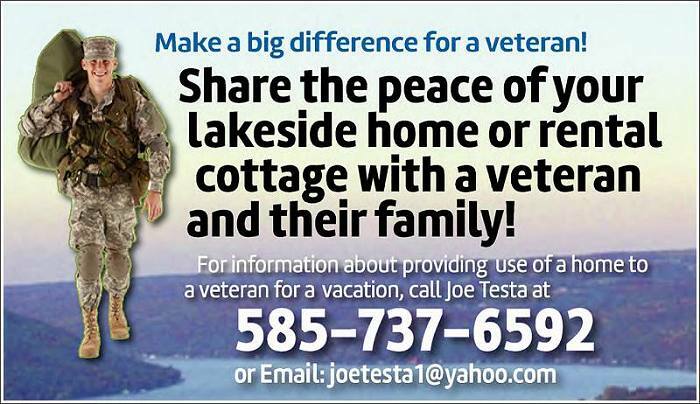 If you would like to show your support or donate your home for a vacation for a returning veteran, please contact us at 585-737-6592. Finger Lakes Homes For Our Veterans is a not-for-profit (501c3) organization.